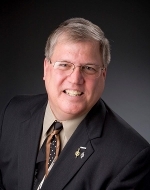 A member of the public relations faculty in the Gaylord College at the University of Oklahoma, Robert “Pritch” Pritchard, APR, Fellow PRSA has more than 25 years’ experience as a public affairs officer in the U.S. Navy and more than 18 years as a public relations educator. In May 2015, he joined The Golding Group (www.goldinggroup.com) as partner and chief strategic counsel. When not teaching, he brings his more than 40 years of experience in public relations, “big picture” communications thinking and executive mentoring to bear to help businesses and nonprofit organizations attain long-term, sustainable growth. “Pritch” completed a 27-year naval career as the director of public relations for the United States European Command in Stuttgart, Germany, his third consecutive Unified Command public relations position. In the span of those three assignments, he managed all U.S. military public relations activity in 73 countries, territories and possessions in the Pacific, 91 countries in Africa, Europe and the Middle East, and for the Nation’s strategic forces. Throughout his career as a Navy public affairs officer, he was the principle spokesperson for many sensitive issues including the 1983 terrorist bombing of the Marine barracks in Beirut, Lebanon, and the capture of the Achille Lauro pirates. He was the first public relations officer assigned to the elite U.S. Navy SEALs. His teaching and research expertise includes student leadership development, Student-run Firms, strategic public relations planning, crisis communications and media relations. He serves as the Faculty Adviser for the Stewart Harral Chapter of the Public Relations Student Society of America (PRSSA) at OU and for Lindsey + Asp, the advertising and public relations Nationally Affiliated Student-run Firm in Gaylord College. He is a member of the PRSA College of Fellows (Class of 2004), the 2013 PRSA Outstanding Educator, the 2011–2015 PRSSA National Faculty Adviser and a past chair of the PRSA Educators Academy. He continues to serve on the 2017–2019 PRSA Strategic Planning Committee and the PRSA Conversion and Value Task Force.